Post developed by Katie Brown in coordination with Mike Traugott. This post is part of a series that explores how Center for Political Studies (CPS) researchers came to their work. Here, we follow the academic path of CPS Research Professor and Professor of Communication Studies, Mike Traugott. 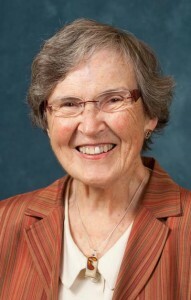 Professor Traugott’s career began at Princeton University. While an undergraduate studying political science, he served as a research assistant for Dr. George Gallup, founder of the prominent polling group the Gallup Organization. His senior thesis advisor, Professor Stanley Kelley, urged him to attend graduate school at the University of Michigan. Traugott’s intention was to learn more about the field and then return to working for Gallup, with no thought of becoming a university-based researcher, let alone a college professor. While at the University of Michigan, Traugott worked with Warren Miller – of Campbell, Converse, Miller, & Stokes fame – on the seminal study of The American Voter. Beginning in 1968 and through the 1970s, Miller and Traugott helped ABC News develop their campaign coverage. The project took place amidst innovation in polling. First, telephone interviewing evolved to become an industry standard. And second, television networks partnered with major daily newspapers to conduct polls. Traugott was fascinated by and part of how public opinion evolved into a newsworthy topic. 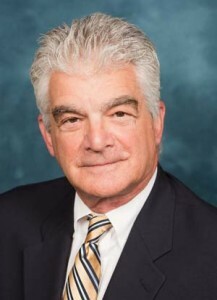 Trained as a political scientist and with deep experience in polling, Traugott became a leading expert on survey methodology, public opinion, and voting technology. He teaches extensively, and his research has resulted in the publication of 12 books and 100 articles and chapters. This entry was posted in Profile on September 27, 2013 by David Howell. How you map your community = how you vote? Post developed by Katie Brown in coordination with Cara Wong. The maps below show the same small city. 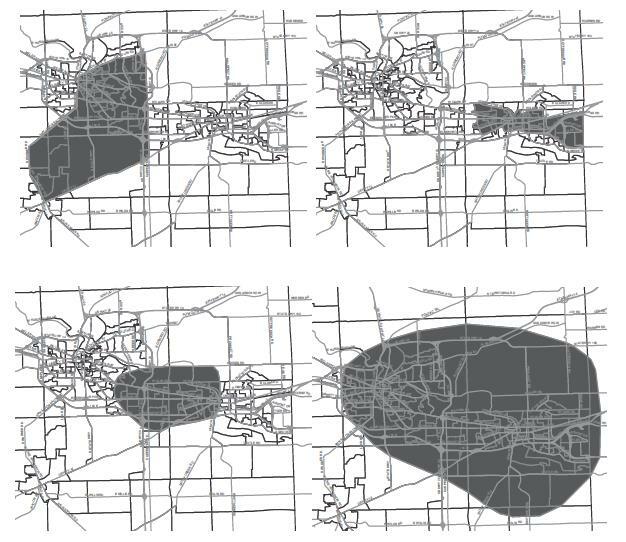 The shaded area shows how residents delineate their community. The differences are notable. But do these internal maps impact how people make political decisions? Center for Political Studies Adjunct Faculty Associate and University of Illinois Associate Professor of Political Science Cara Wong studies perceptions of communities and how this impacts policy support. With colleagues Jake Bowers and Tarah Foster Williams of the University of Illinois, and Katherine Drake Simmons of the Pew Research Center, Wong published a paper in the Journal of Politics that considers how these mental maps relate to policy support. In the study, participants were shown a map of the blocks surrounding their home and a map of their county, and asked to highlight their local community on either. Two thirds focused on the block maps, while one third shaded communities on the county maps. The size highlighted ranged from smaller than a block to larger than two cities. Some participants even highlighted non-contiguous areas. Then, the participants were asked to describe the demographics of the area they highlighted. Questions included the proportion of blacks and whites, Democrats and Republicans, and unemployed. Next, they were asked about their take on these factors in the United States in general. Results show that participants view their communities and the United States at large as having more blacks (15% more on average) and fewer whites than the census. Unemployment and racial distortions are bigger than partisan distortions. All three are distorted to some extent across the block, community, and country levels. The highlighted areas varied between participants. Their internal maps of their communities also differ from how the government creates administrative boundaries. But to what effect? The ‘fear of crime’ literature in sociology has explained that personal and altruistic fear—regardless of accuracy—leads to purchases (e.g., guns), behavioral changes (e.g., not going out at night), and abandonment of locations (e.g., parks and industrial areas). Political scientists need to understand whether perceptions of community heterogeneity and interracial competition have equally serious consequences for political actions and outcomes. This entry was posted in Elections, Innovative Methodology, National on September 23, 2013 by David Howell. Post developed by Katie Brown in coordination with Brian Min. 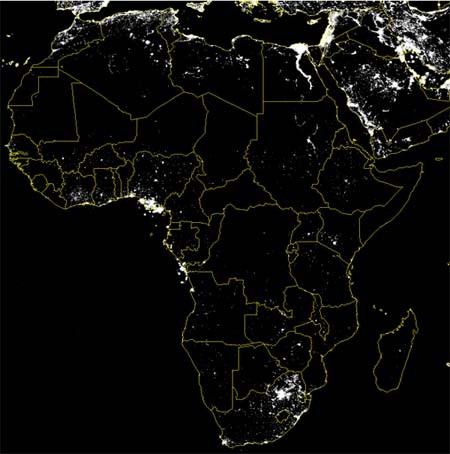 This satellite image identifies nightlights in Africa. 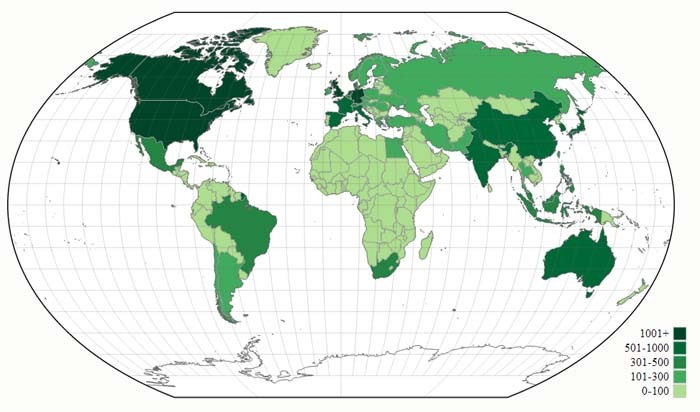 The accuracy of maps like this has been validated for developed regions. But how accurate are these maps for smaller villages in developing nations, like Western Africa? The project seeks to test the reliability of DMSP-OLS imagery. The study focuses on Senegal and Mali and consists of two parts. On the ground, the researchers interviewed the chiefs of 202 villages in Senegal and the AMADER operators in 30 villages in Mali about electricity use. These results were coupled with data on 800 unelectrified villages in Senegal and 99 in Mali, as identified via administrative data and paper maps. Then, the data were compared to DMSP-OLS imagery. The study finds that DMSP-OLS imagery is indeed a reliable indicator of electricity in villages. But there are some caveats. First, streetlights drive light detection, whereas household electricity does not register as brightly. So, villages with more streetlights appear brighter in the satellite imagery. Second, the imagery is sensitive to weather conditions, especially cloud cover. Finally, the reliability of the images increases when they are composites created over time. 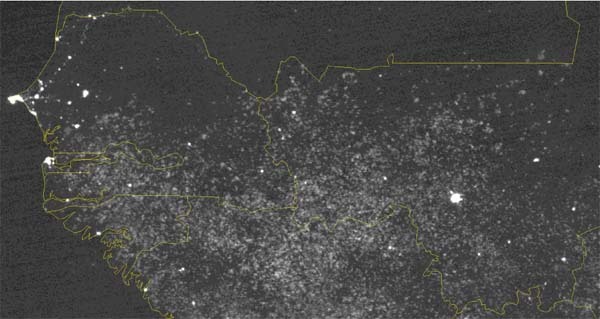 For example, the image below shows the two countries – Senegal to the west and part of Mali to the east – over the course of May 2011. Validating DMSP-OLS as an indicator of electricity in remote villages of the developing world has several implications. First, these images are more cost effective than on-the-ground surveys. Second, these images are captured nightly, creating a natural archive. Third, this allows identification of otherwise remote villages in the developing world. With DMSP-OLS, the World Bank can monitor existing projects and initiate new projects to enhance global connectivity, communication, and transparency. This entry was posted in Elections, Innovative Methodology, International on September 19, 2013 by David Howell. Post developed by Katie Brown in coordination with Rosemary Sarri. This post is part of a series that explores how Center for Political Studies (CPS) researchers came to their work. Here, we trace the trajectory of CPS, School of Social Work, and Women’s Studies Professor Emerita Rosemary Sarri. A strong Scandinavian influence could be felt in the progressive causes and commitment to community development in Sarri’s native rural Minnesota. Though her family had little money, Sarri and her siblings were urged to attend college. Sarri went onto attend the University of Minnesota, graduating with deepened commitment to social engagement but no clear sense of a career path. Sarri spent time working as a social worker in a settlement house, with gangs, and for a 4-H club. The political and social backdrop of the Civil Rights Movement and Feminist Movement strengthened her dedication to justice. Sarri soon returned to the University of Minnesota to complete her Masters in Social Work. It was during this time that she zeroed in on a question: How are we going to foster our young adult population? Seeking answers, Sarri moved onto complete a Ph.D. in Social Work and Sociology at the University of Michigan. Sarri continued to work in academia. Her longitudinal studies especially reveal two troubling facts. First, kids in the child welfare system are the same kids who drift into the justice system. Second, this problem is getting worse. Her research brings awareness to this under-served part of society. In addition to research, Sarri combats these problems on the ground. She has worked directly with child offenders in a variety of contexts, served on several presidential commissions, and worked to build infrastructures for child welfare systems on every continent except Antarctica. Despite witnessing the entrenched and growing nature of these issues, Sarri remains optimistic. Though she understands that it would be easy to cower in the face of this societal blight, a simple question drives her to fight for the lives of children: How can I help make this better? This entry was posted in Profile on September 16, 2013 by David Howell. How interested is your state or country in the ANES? Post developed by David Howell. Visuals prepared by Karina Kervin. As we approach the sixty-fifth anniversary of the American National Election Studies (ANES) project, it is helpful to reflect on the continued and extensive interest in the project, both within the United States and globally. With that in mind, the following visuals convey the number of visitors to the ANES website by state and country, over the past two years. 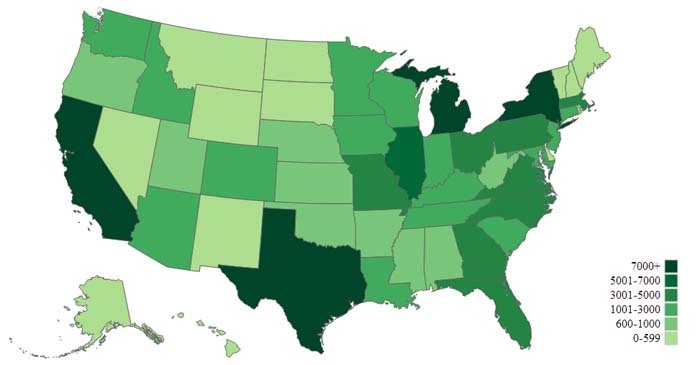 If you click on either of the below images, you will be taken to a corresponding page where you can hover your mouse over the map to see the number of website visitors from specific states and countries. Note that users of Internet Explorer may have difficulty accessing the interactive version of the maps due to a browser compatibility issue (we are working on this). This entry was posted in ANES, National on September 11, 2013 by David Howell. Post developed by Katie Brown in coordination with Michael Traugott. In the American presidential election of 2012, most polls predicted a narrow win for Democratic incumbent Barack Obama over Republican challenger Mitt Romney. But on November 5, 2012, Obama won both the popular vote (62,611,250 to 59,134,475) and the Electoral College (332 to 206) by a comfortable margin. Most major polling organizations underestimated Obama’s votes, yet closely targeted Romney’s outcome. Gallup and Rasmussen, on the other hand, overestimated Romney’s vote share, projecting that he would win. In order to understand its error and, more importantly, correct its estimation for future elections, Gallup called upon Professor of Communication Studies and Center for Political Studies (CPS) Research Professor Mike Traugott. Traugott studies public opinion, survey methodology, and voting technology, with more than 100 articles and book chapters and 12 books published. Traugott’s connection to the project goes beyond his expertise. Early in his career, he worked for Gallup founder George Gallup. Traugott has also served as president of the American Association for Public Opinion Research (AAPOR). In 2008, he chaired an AAPOR committee to investigate the causes of an industry-wide estimation error in the New Hampshire primary. As a follow up, AAPOR launched an initiative to make polling practices more transparent. Though the initiative garnered initial support, it hasn’t matured as rapidly as hoped because many commercial firms are reluctant to expose their proprietary methods. Yet, given the widespread mispredictions of 2012, Gallup agreed to make its investigation transparent as a service to the public and the pre-election polling profession. Gallup’s initial investigation, led by Traugott and published here, identifies several potential contributing factors to the errant projection. The main problem appears to lie in the sampling design. Gallup interviews potential voters using only a combination of listed landline and cell phones. Because listed landline users are more likely to be conservative, Gallup’s respondent pool skewed conservative. Other potential factors include giving more weight to past voting behavior than other polls, time zone issues, and the format of race and ethnicity questions. Further, Gallup, like other major polling organizations, does not take the candidates’ campaign effort into account. As this map illustrates, in 2012, the candidates focused most of their campaign spending in battleground states, which in turn impacted turnout and vote choice by state. This entry was posted in Current Events, Elections, Innovative Methodology, National on September 5, 2013 by David Howell. Post developed by Katie Brown in coordination with Allen Hicken. Each year, 30 typhoons and tropical storms batter the Philippines. The damage costs between $17 and $19 million per year, nearly 10 percent of the nation’s GDP. The Japanese Meteorological Agency developed a storm tracking system that measures date, time, location, wind speed, barometric pressure, and storm type every six hours. The map below displays the paths of storms striking the country in 2010. 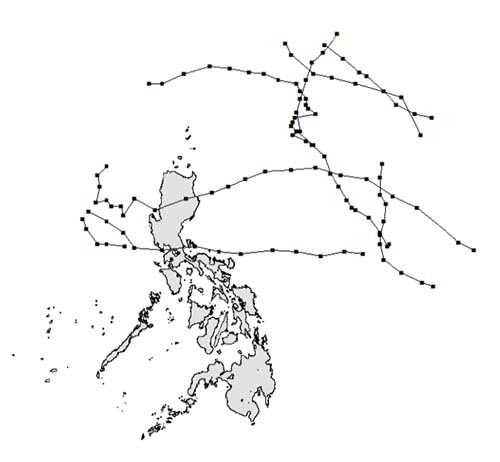 In addition to tracking typhoons, could this map also help gauge the role of political affiliations in the distribution of public resources, a.k.a., pork barreling? Enter the work of Center for Political Studies (CPS) researcher Allen Hicken, who is also Director of the Center for Southeast Asian Studies and Associate Professor of Political Science. In a forthcoming paper, “Pork & Typhoons: The Political Economy of Disaster Assistance in the Philippines,” Hicken, along with graduate students James Atkinson and Nico Ravanilla, developed a new approach to studying pork barreling. Specifically, the research uses a storm index created by University of Michigan faculty member Dean Yang to create a baseline of expected relief fund distribution and trace variations by political ties. The Philippines’ democracy is both one of the oldest and weakest in Asia. Political clans are central to Filipino political life. The research considers political ties both in terms of party links and clan connections between a politician and a region. To what extent do political calculations affect the allocation of government disaster reconstruction funds? The results show that need does indeed impact relief received. However, the authors also find that, “Political ties between members of congress and local mayors, especially clan ties, increase per capita targetable funds allocated to that municipality.” Thus, tracking typhoons can expose pork barreling. Though typhoons and clan ties may be unique to the Philippines, natural disasters and pork barreling are global phenomena. Thus, the innovative methodology pioneered in this paper could be applied to other nations to increase understanding of political ties and resource allocation. This entry was posted in Current Events, Elections, Foreign Affairs, Innovative Methodology, International on September 3, 2013 by David Howell.